This article is about the type of scientific experiment. For other uses, see In vitro (disambiguation). In vitro (meaning: in the glass) studies are performed with microorganisms, cells, or biological molecules outside their normal biological context. Colloquially called "test-tube experiments", these studies in biology and its subdisciplines are traditionally done in labware such as test tubes, flasks, Petri dishes, and microtiter plates. Studies conducted using components of an organism that have been isolated from their usual biological surroundings permit a more detailed or more convenient analysis than can be done with whole organisms; however, results obtained from in vitro experiments may not fully or accurately predict the effects on a whole organism. 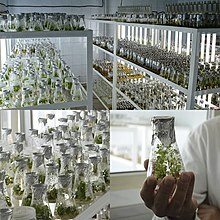 In contrast to in vitro experiments, in vivo studies are those conducted in animals, including humans, and whole plants. In vitro (Latin: in glass; often not italicized in English) studies are conducted using components of an organism that have been isolated from their usual biological surroundings, such as microorganisms, cells, or biological molecules. For example, microorganisms or cells can be studied in artificial culture media, and proteins can be examined in solutions. Colloquially called "test-tube experiments", these studies in biology, medicine, and their subdisciplines are traditionally done in test tubes, flasks, Petri dishes, etc. They now involve the full range of techniques used in molecular biology, such as the omics. In contrast, studies conducted in living beings (microorganisms, animals, humans, or whole plants) are called in vivo . Examples of in vitro studies include: the isolation, growth and identification of cells derived from multicellular organisms in (cell or tissue culture); subcellular components (e.g. mitochondria or ribosomes); cellular or subcellular extracts (e.g. wheat germ or reticulocyte extracts); purified molecules such as proteins, DNA, or RNA); and the commercial production of antibiotics and other pharmaceutical products. Viruses, which only replicate in living cells, are studied in the laboratory in cell or tissue culture, and many animal virologists refer to such work as being in vitro to distinguish it from in vivo work in whole animals. Polymerase chain reaction is a method for selective replication of specific DNA and RNA sequences in the test tube. Protein purification involves the isolation of a specific protein of interest from a complex mixture of proteins, often obtained from homogenized cells or tissues. In vitro fertilization is used to allow spermatozoa to fertilize eggs in a culture dish before implanting the resulting embryo or embryos into the uterus of the prospective mother. In vitro diagnostics refers to a wide range of medical and veterinary laboratory tests that are used to diagnose diseases and monitor the clinical status of patients using samples of blood, cells, or other tissues obtained from a patient. 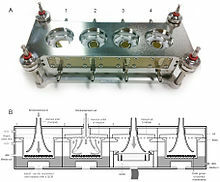 In vitro testing has been used to characterize specific adsorption, distribution, metabolism, and excretion processes of drugs or general chemicals inside a living organism; for example, Caco-2 cell experiments can be performed to estimate the absorption of compounds through the lining of the gastrointestinal tract; The partitioning of the compounds between organs can be determined to study distribution mechanisms; Suspension or plated cultures of primary hepatocytes or hepatocyte-like cell lines (HepG2, HepaRG) can be used to study and quantify metabolism of chemicals. These ADME process parameters can then be integrated into so called "physiologically based pharmacokinetic models" or PBPK. In vitro studies permit a species-specific, simpler, more convenient, and more detailed analysis than can be done with the whole organism. Just as studies in whole animals more and more replace human trials, so are in vitro studies replacing studies in whole animals. Living organisms are extremely complex functional systems that are made up of, at a minimum, many tens of thousands of genes, protein molecules, RNA molecules, small organic compounds, inorganic ions, and complexes in an environment that is spatially organized by membranes, and in the case of multicellular organisms, organ systems. These myriad components interact with each other and with their environment in a way that processes food, removes waste, moves components to the correct location, and is responsive to signalling molecules, other organisms, light, sound, heat, taste, touch, and balance. This complexity makes it difficult to identify the interactions between individual components and to explore their basic biological functions. In vitro work simplifies the system under study, so the investigator can focus on a small number of components. For example, the identity of proteins of the immune system (e.g. antibodies), and the mechanism by which they recognize and bind to foreign antigens would remain very obscure if not for the extensive use of in vitro work to isolate the proteins, identify the cells and genes that produce them, study the physical properties of their interaction with antigens, and identify how those interactions lead to cellular signals that activate other components of the immune system. Another advantage of in vitro methods is that human cells can be studied without "extrapolation" from an experimental animal's cellular response. The primary disadvantage of in vitro experimental studies is that it may be challenging to extrapolate from the results of in vitro work back to the biology of the intact organism. Investigators doing in vitro work must be careful to avoid over-interpretation of their results, which can lead to erroneous conclusions about organismal and systems biology. For example, scientists developing a new viral drug to treat an infection with a pathogenic virus (e.g. HIV-1) may find that a candidate drug functions to prevent viral replication in an in vitro setting (typically cell culture). However, before this drug is used in the clinic, it must progress through a series of in vivo trials to determine if it is safe and effective in intact organisms (typically small animals, primates, and humans in succession). Typically, most candidate drugs that are effective in vitro prove to be ineffective in vivo because of issues associated with delivery of the drug to the affected tissues, toxicity towards essential parts of the organism that were not represented in the initial in vitro studies, or other issues. These two approaches are not incompatible; better in vitro systems provide better data to mathematical models. However, increasingly sophisticated in vitro experiments collect increasingly numerous, complex, and challenging data to integrate. Mathematical models, such as systems biology models, are much needed here. In pharmacology, IVIVE can be used to approximate pharmacokinetics (PK) or pharmacodynamics (PD). Since the timing and intensity of effects on a given target depend on the concentration time course of candidate drug (parent molecule or metabolites) at that target site, in vivo tissue and organ sensitivities can be completely different or even inverse of those observed on cells cultured and exposed in vitro. That indicates that extrapolating effects observed in vitro needs a quantitative model of in vivo PK. Physiologically based PK (PBPK) models are generally accepted to be central to the extrapolations. In the case of early effects or those without intercellular communications, the same cellular exposure concentration is assumed to cause the same effects, both qualitatively and quantitatively, in vitro and in vivo. In these conditions, developing a simple PD model of the dose–response relationship observed in vitro, and transposing it without changes to predict in vivo effects is not enough. ^ American Psychological Association (2010), "4.21 Use of Italics", The Publication Manual of the American Psychological Association (6th ed. ), Washington, DC, USA: APA, ISBN 978-1-4338-0562-2. ^ Artursson P.; Palm K.; Luthman K. (2001). "Caco-2 monolayers in experimental and theoretical predictions of drug transport". Advanced Drug Delivery Reviews. 46 (1–3): 27–43. doi:10.1016/s0169-409x(00)00128-9. PMID 11259831. ^ Gargas M.L. ; Burgess R.L. ; Voisard D.E. ; Cason G.H. ; Andersen M.E. (1989). "Partition-Coefficients of low-molecular-weight volatile chemicals in various liquids and tissues". Toxicology and Applied Pharmacology. 98: 87–99. doi:10.1016/0041-008x(89)90137-3. ^ Pelkonen O.; Turpeinen M. (2007). "In vitro-in vivo extrapolation of hepatic clearance: biological tools, scaling factors, model assumptions and correct concentrations". Xenobiotica. 37 (10–11): 1066–1089. doi:10.1080/00498250701620726. ^ Vignais, Paulette M.; Pierre Vignais (2010). Discovering Life, Manufacturing Life: How the experimental method shaped life sciences. Berlin: Springer. ISBN 90-481-3766-7. ^ Jacqueline Nairn; Price, Nicholas C. (2009). Exploring proteins: a student's guide to experimental skills and methods. Oxford [Oxfordshire]: Oxford University Press. ISBN 0-19-920570-1. ^ "Existing Non-animal Alternatives". AltTox.org. 8 September 2011. ^ Quignot N.; Hamon J.; Bois F. (2014). Extrapolating in vitro results to predict human toxicity, in In Vitro Toxicology Systems, Bal-Price A., Jennings P., Eds, Methods in Pharmacology and Toxicology series. New York, USA: Springer Science. pp. 531–550. ^ Rothman, S. S. (2002). Lessons from the living cell: the culture of science and the limits of reductionism. New York: McGraw-Hill. ISBN 0-07-137820-0. ^ De Clercq E (October 2005). "Recent highlights in the development of new antiviral drugs". Curr. Opin. Microbiol. 8 (5): 552–60. doi:10.1016/j.mib.2005.08.010. PMID 16125443. ^ Sung, JH; Esch, MB; Shuler, ML (2010). "Integration of in silico and in vitro platforms for pharmacokinetic-pharmacodynamic modeling". Expert Opinions in Drug Metabolism and Toxicology. 6: 1063–1081. doi:10.1517/17425255.2010.496251. ^ Quignot, Nadia; Bois, Frédéric Yves (2013). "A computational model to predict rat ovarian steroid secretion from in vitro experiments with endocrine disruptors". PLoS ONE. 8 (1): e53891. doi:10.1371/journal.pone.0053891. PMC 3543310. PMID 23326527. ^ Yoon M, Campbell JL, Andersen ME, Clewell HJ (2012). "Quantitative in vitro to in vivo extrapolation of cell-based toxicity assay results". Critical Reviews in Toxicology. 42: 633–652. doi:10.3109/10408444.2012.692115. ^ Louisse J, de Jong E, van de Sandt JJ, Blaauboer BJ, Woutersen RA, Piersma AH, Rietjens IM, Verwei M (2010). "The use of in vitro toxicity data and physiologically based kinetic modeling to predict dose–response curves for in vivo developmental toxicity of glycol ethers in rat and man". Toxicological Sciences. 118: 470–484. doi:10.1093/toxsci/kfq270. Look up in vitro in Wiktionary, the free dictionary.